I must admit, I am a little jar crazy! Put food in a jar and I not only want to eat it but can’t wait to make it. 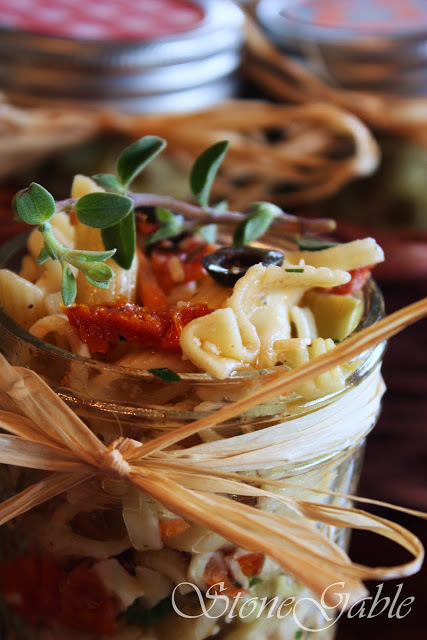 Pasta Salad In A Jar was ON THE MENU for the last picnic of the summer at StoneGable. Served from a big basket, they make such a wonderful and fun presentation. Wouldn’t these work fabulously at a tailgate… a barn dance… a bonfire or anything that portable food is in order? Using a smaller half pint jar would work to give everyone a nice smaller size portion! This is not a “rocket science” recipe. Use a little more or less, a little this or that. Change the ingredients to suite your taste. Cook pasta according to the package directions, or even just a little underdone. Drain and put into a large bowl. Add 1 bottle of good Greek salad dressing and mix well. Add the remaining ingredients and mix. Add more dressing if desired. Add a sprig of garnish to the top. 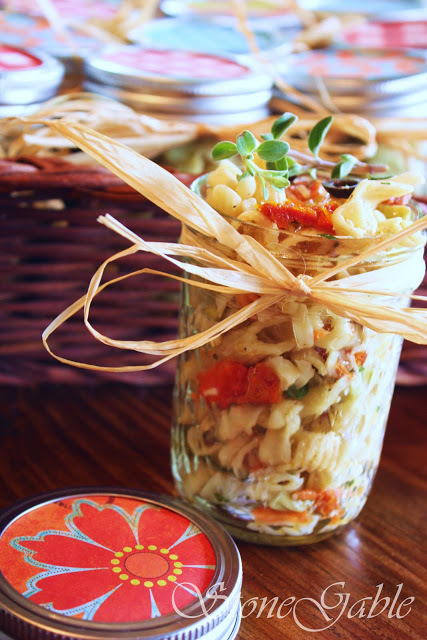 SG Tip: Tie the raffia around the jar before adding the pasta salad. Love your site, every now and then I stray but always come back to this site. 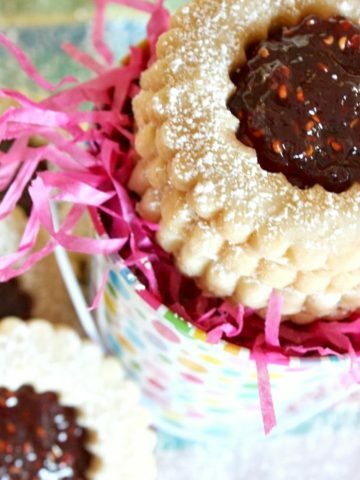 Thank you so much for sharing your fabulous recipes and all the beautiful decor ideas. Happy 4th to all of you. So glad you keep coming back, Jeri! Hugs~! Wow,this looks delicious! I love your presentation and how adorable the jars and the raffia looks! Your blog is beautiful…found you on Pinterest…having a look around! Feeling a bit like Fall in the mornings at our house..but still 90 degrees during the day…I cannot wait for Fall to really be here! This is awesome. You are making me jar crazy too! It’s fun. Larde glass canisters like the ones at Walmart or IKEa work great for potlucks too. 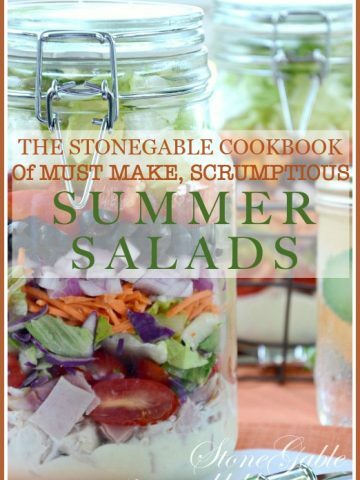 Oh my…this looks so refreshing and what a great idea to put the pasta salad in the jars to picnic! 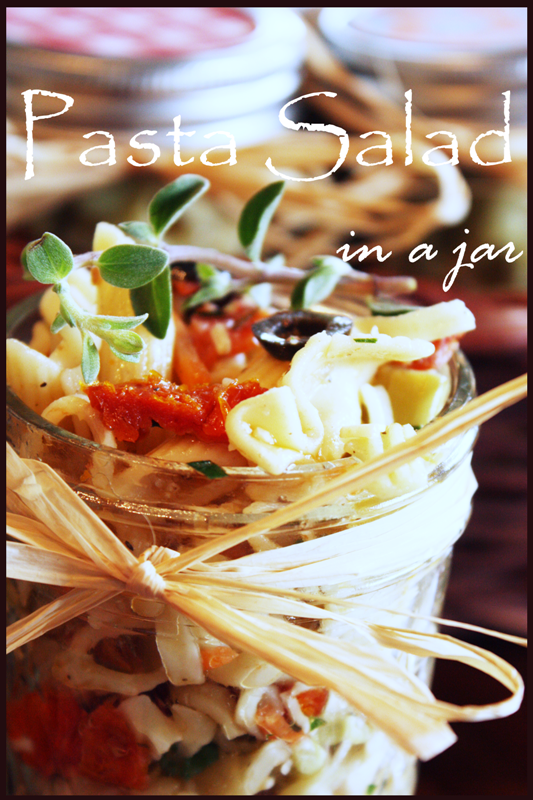 This was a great Idea using the jars for your pasta salad!!! I also have blue jars this is gevig me some Ideas. Thanks so much for sharing with as all. I hope you have a great weekend. What a great idea..next time I take lunch to the office for the girls I’m doing this!! What a fun idea, Yvonne!! 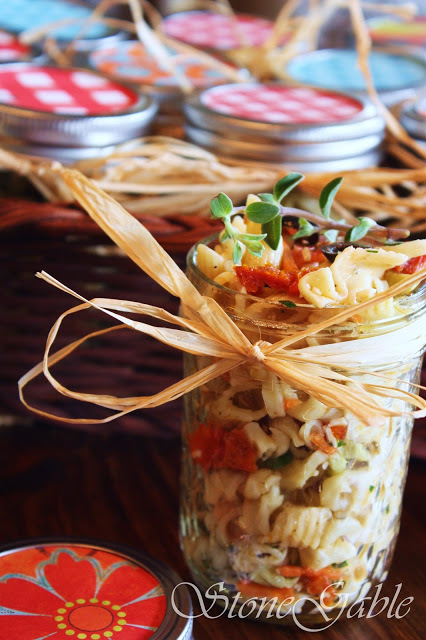 The jars make pasta salad extra special. I’d feel very special having my own personal jar. Great idea! This sounds yummy, being Greek American I will have to make. Thanks so much. Hope weather gets better for your area….and us!! Always so clean looking too! What a fun and yet simple presentation. Hope you are staying dry – I am in the Chambersburg area and have seen how bad it is around Lancaster. The air has been so humid I actually had to use a blow dryer on my cookies yesterday. What a beautiful way to serve food, it looks so pretty and I imagine that there is as much pleasure in preparing as in eating when it looks this good! this is what I want to make this next weekend! Looks lovely! I have some things for you and will get an email off soon! I am with you! I love individual servings and jars are just perfect. It makes anything special. This sounds wonderful. I could eat pasta salad non stop. Hey Yvonne, I am loving jars too. I’ve been making little apple pies in mine and serving them for desert. 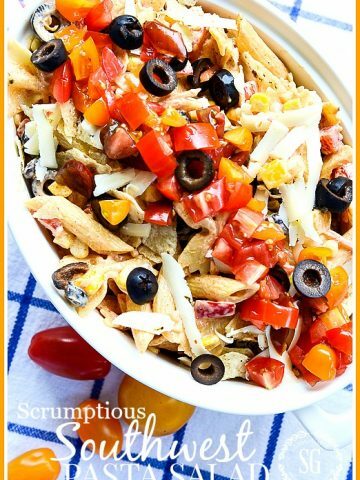 I just love the look and they are the perfect serving size! Love your salad I’m going to try it this weekend. Sounds and looks delicious. Saved the recipe to try. That salad looks wonderful served that way, Yvonne. I make a very similar one but have never served it in this way. Thanks for the great idea. What a sweet idea! I love pasta salad. Your recipe looks so yummy, and packed into those jars just makes it look so fun! Hope your rain and flooding ends soon! Have a great weekend. This is a cute and clever idea…love it!! Love it! Fabulous idea Yvonne. Yvonne you’ve got that special touch to make everything you prepare look wonderful. What a cute and cleaver idea. I love this.